Child-friendly? Back again in theaters with plenty of 3D magic to boot, Pixar's masterpiece Finding Nemo is about as child-friendly a movie as they come. With plenty of humor, friendship, adventure, stunning animation and a strong moral center, this beloved family film is perfect for kids and kids at heart. Whoa, whoa, wait a minute. Can anyone else believe it's been almost 10 YEARS since Disney and Pixar first released Finding Nemo back in 2003? Now that it's back for a second go around with updated 3D animation, I'm starting to wonder exactly where all that time has gone. I can remember taking my own little ones to see Nemo in theaters… can I even call them kids still? 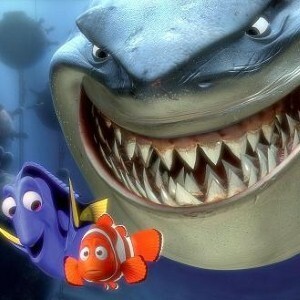 Anyway, that's beside the point – what we should really focus on is how exciting it will be to see Finding Nemo in 3D! Normally, I like to have a little fun with movies that are re-released in 3D. Despite how good or bad the movie might be, this style of animation trends to strike me as a bit hokey. "Oooo, the axe looks like it's coming right at me!" "Look at the giant hand popping out of the screen!" Please. Unless you're Marty McFly, there's no reason that an obviously fake 3D shark should impress anyone… unless that shark was animated by the creative team at Pixar, that is. Let's face it, those guys can do no wrong, and 3D only amplifies the graphical awesomeness they've already achieved time and time again. For anyone who hasn't already seen Finding Nemo, the story follows a lovable clown fish named Nemo who desperately wants to leave the confines of home and see the world. However, his overprotective and panicky father, Marlin, thinks he's far too young to venture outside the next. But that all changes when Nemo is captured by scuba divers and thrown into captivity inside a dentist office's aquarium. Fearing for his son's life, Marlin takes off across the ocean to – yep – find Nemo. Featuring the voice talents of Albert Brooks, Ellen Degeneres, Willem Dafoe, Geoffrey Rush, Brad Garrett and Allison Janney, among others, Finding Nemo definitely ranks among the upper echelon of Pixar creations. And with already-stunning visual effects, the addition of 3D appeal just gives you another reason to dive back into this charmingly aquatic world. Child-friendly? Whether your kids have seen Finding Nemo once, twice, a hundred times or never, they're sure to fall in love with this 3D re-release that demonstrates the power that friendship, family and believing in yourself can have. Recommended for children of all ages, and I challenge you to find someone who doesn't enjoy this Pixar classic.